We break down the Georgetown game - and we give our fearless prediction below the flip. Like many college football fans, I was surprised to see Maryland start out the season strong with a 3-1 record. It's easy to pull for the Terps if you're a Georgetown or Lehigh fan. First, former Lehigh head coach Pete Lembo is special teams coordinator, tight ends coach and assistant head coach to Maryland skipper D.J. Durkin. Lembo, a former Georgetown lineman, was head coach from 2001-2005, going 44-14 over that stretch and leading the Mountain Hawks to two Patriot League championships in 2001 and 2004. He happened to also be skipper during Lehigh's last two home FCS playoff games at Murray Goodman Stadium as well: vs. Hofstra (2001, Win) and vs. James Madison (2004, Loss). The second reason to pull for the Terps, though, is their kicker. Terps PK Henry Darmstadter was recently profiled in The Washington Post as having taken a very unlikely path to Big 10 football: through a three year football odyssey with Georgetown. How much would you pay to be a part of a Big Ten football program? To play a Division I game in the Horseshoe? To get texts from your friends who can’t believe you’re on national television? Henry Darmstadter figures some people would pay millions for that chance, and some wouldn’t pay a dime. For him, the cost looked like this: one year of forgoing a full-time salary befitting his Georgetown economics degree, one year of paying out of pocket for grad school tuition and one year of renting a room from a family near College Park on the off chance that he might become Maryland’s starting kicker. The fun part of doing these previews is that I can also see what I wrote about Darmstadter as well. Last year, I called Georgetown's special teams a "weapon", while calling Darmstadter "the best kicker in the Patriot League hands down. He hasn't missed an extra point this season or last and has shown and NFL-caliber leg, going 6 of 8 on FG attempts with a 43 yarder and a 47 yarder to his credit." As a Lehigh fan, I'm delighted by Henry's story - and secretly kind of glad Lehigh doesn't have to face him. The base part of Georgetown's offense is similar to the same setups we've seen in years past with the Hoyas, with a pro set, running back, fullback, tight end and slot back/wide receiver. However, head coach Rob Sgarlata has the offense line up in a variety of sets - empty backfield spread, no tight end, H-back - it's actually a bunch of looks. Despite the number of different looks, Georgetown's offense has struggled all year so far, averaging only 14.8 points per game and only 12 first downs per game as well. Some of that can be attributed to some injuries at quarterback, but in the game I watched, the Hoyas were able to move the ball effectively at times with a surprisingly effective mid-range passing game. Normally, it is not allowed for a quarterback to wear a jersey in the 30s, but senior QB Tim Barnes is not ordinary player. Georgetown generally chooses one player a year to wear the special No. 35 Joe Eacobacci memorial jersey (this year it's two), and for the second year running, Barnes will be wearing that number, thanks to the NCAA allowing it. Eacobacci suited up for the Hoyas from 1993-95, serving as a team captain as a senior, before graduating in 1996. He was an energy trader for the investment firm Cantor Fitzgerald on the 105th floor of the North Tower of the World Trade Center where he tragically lost his life on September 11, 2001. Barnes returns as the starter for the Hoyas after sitting out the last two games with an injury in the Hoyas' loss to Columbia. What success the Hoyas have had over the last two years has come with Barnes under center - Georgetown won their first three games with him at the helm last year, and beat Campbell to start the season this year with him at QB as well, even though they lost eight straight games after they lost him to the season last year after a collarbone injury and have lost three straight after his injury this season. Barnes does a lot of play-action and has some good escapability as a quarterback, but he's struggled to get in a steady rhythm on offense in his other games this season. He steps up in the pocket and if given time, he is pretty accurate tossing mostly short- and intermediate-range passes. Senior RB Alex Valles is the Hoyas' main running back, with junior FB Christian Bermudez as the physical, vulture back at the goal line. Both are bigger, physical backs. When senior RB Issac Elsworth comes in to spell Valles, he's more of the speedy change-of-pace guy, but overall the Hoyas' running game has been very, very effectively stifled. 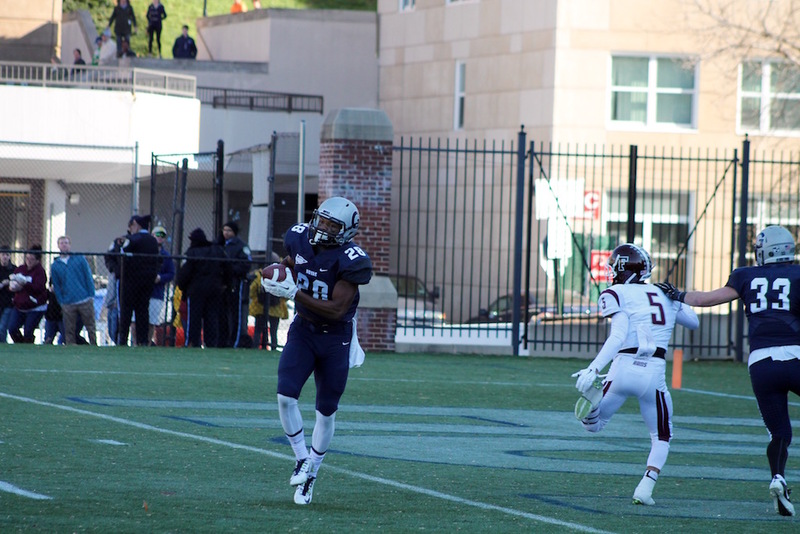 The entire Hoya offense has 247 net yards rushing on the entire season. Barnes primary target is sophomore WR Michael Dereus (350 yards, 3 TDs) that has emerged as a very good, young, talented receiver. Along with slot senior WR Justin Harrell (114 yards) and junior WR Brandon Williams (223 yards), Barnes has some pretty good receiving targets if he's given time to throw. Part of the Hoyas' issues with offense this season come from their offensive line, which give up on average nearly five tackles for loss a game, even though sacks allowed isn't all that out of line. 6'6 280 lb senior OL Nick James anchors the line. One other stat that's telling: senior TE Muhammad Wainright doesn't have any receptions this year. That's because when he's in, he's in there to provide an extra blocker. Georgetown plays a base 4-3 defense that is the strength of their team, in particular their front seven. It's a change from the 3-4 they played last year, but their attacking, aggressive style in the front seven has not. Sophomore DE Khristian Tate is the current star of Georgetown's D line, with 26 tackles, 5 tackles for loss and 2 fumble recoveries, numbers that might put him on the Patriot League all-Conference team at years' end if he can keep it up. The 6'0, 292 lb lineman from Georgia joins senior DT Bryan Jefferson, senior DE Kendall Catching, and freshman DT Owen Kessler. Rounding out the starting front seven are senior LB Daniel Yankovich (32 tackles), freshman LB Wesley Bowers (30 tackles), and senior LB Cameron Seward (36 tackles,1 TFL). Last season, the Hoyas blitzed more with their linebackers, but with the 4-3 formation most of them have been staying home more often. Senior FS David Akere is a four-year starter at safety, and also, by special arrangement, wears the No. 35 of Joe Eacobacci as well. Akere is the best player on the entire Georgetown defense, with 43 tackles, 2 INTs, and 3 passes defensed. I've also been continually impressed with senior CB Jelani Williamson, an athletic corner who has a good nose for the ball with 2 fumble recoveries. He was one of the leaders on Georgetown's defense in interceptions as well. Rounding out the unit is junior SS Blaise Brown, who also has two interceptions, and junior CB Ramon Lyons, who has 5 passes defensed. The Hoyas' pass defense gets somewhat overlooked, but this is a quality, skilled unit. Sophomore P/K Brad Hurst is in the unenviable position of stepping into Henry Darmstader's shoes. On the punting and kickoff side, his strong leg has been stellar, notching 8 touchbacks and averaging 42.6 yards per punt. On the field goal side, despite his obviously strong leg, he's struggled with some accuracy, going 6/9 on extra points and going 2/6 on FGs (though he did make a 42 yarder). Senior KR Issac Ellsworth has been Georgetown's main kickoff returner and is a pretty big weapon on kick returns, averaging 27.7 yards per return, while junior SS Blaise Brown returns punts for the second straight week. 1. Building Momentum. This week offered, for the first time all year, the chance for this Lehigh team to build and get better off a victory. I'm sure not everything in the film room was pleasant, but it's critical that the Mountain Hawks build off the positive momentum from the game in Hamilton to continue to execute well here back at home. For Lehigh, building positive momentum means minimizing penalties, minimizing mistakes and making improvements in all facets. 2. Quick start. Georgetown has struggled early in all of their games this year, and frustrating the Hoyas' offense right out of the gate will be very important, especially because their offense isn't built for a shootout. Keeping Georgetown's weak running game in check should make the Hoyas one-dimensional, which means winning the trench battle on this day. 3. Rotating Running. If I'm coach Coen, I'd be sorely tempted to rotate a stable of running backs this week to attack Georgetown's front seven, softening them up for big plays in the passing game. Attacking with junior RB Dominick Bragalone and junior RB Micco Brisker are a given, but I think sprinkling in some of senior RB Nana Amankwah-Ayeh to pound the front seven might also be a good strategy overall. The feeling this week is that Lehigh got a new lease on life last week with their upset win over Colgate. The question is what this team did this week with their new lease on life - will they get better and start to look like a team that could win the Patriot League? Or will there be a lot of the sloppy mistakes that plagued them during their 0-5 start? The truth is, nobody knows yet. This is a week where we're going to learn a lot about this Lehigh team - whether to realistically expect a possible run at a Patriot League title, or whether the Mountain Hawks still have work to do in order to become a program with a winning record. The level of hard work and the level of execution this week will be very telling - one way or another. This is a show-me game. What will Lehigh show?